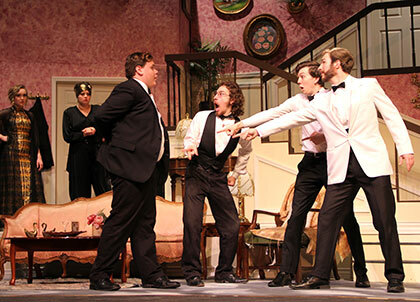 With high impact energy acting and an incredible set to allow for physical comedy, Cowley College’s theatre department knocked it out of the park with their production of Rumors by Neil Simon April 20-22 in the Robert Brown Theatre. The story line revolved around a large, tastefully appointed dinner party where the Deputy Mayor of New York has just shot himself. Gathering for their 10th wedding anniversary, the host lies bleeding in the other room and his wife is nowhere in sight. His lawyer, Ken and wife Chris must get "the story" straight before the other guests arrive. As the confusions and mis-communications mount, the evening spins off into classic farcical hilarity. Theatre director Cara Kem and technical director John Rohr teamed up to produce the hilarious farce.